Submission Comments allows users to view all comments sent and received from assignment submissions. You can reply to submission comments directly from Conversations. You can also reply to comments directly from assignment submissions. 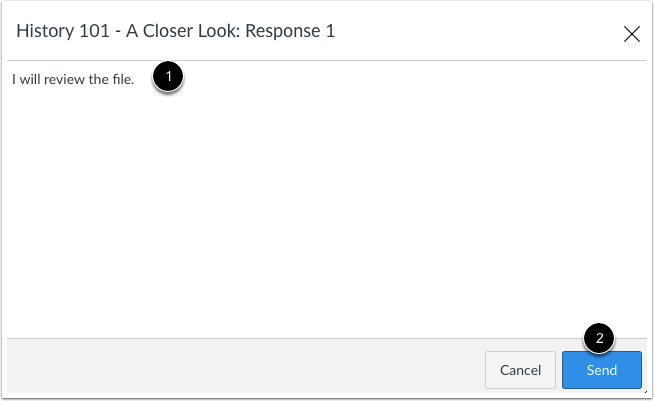 Learn how to view assignment comments from your instructor. Note: For muted assignments, submission comments are not displayed until the assignment is unmuted. 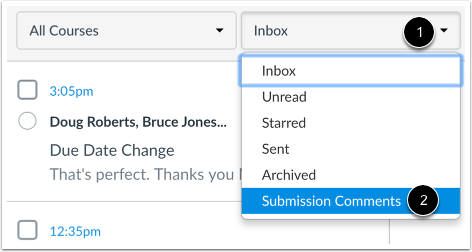 Click the Inbox filter  and select the Submission Comments option . Each message contains the name of the course and the name of the submission. Click the submission comment where you want to reply. In the toolbar, click the Reply icon . You can also click the reply icon in the conversation thread . Note: In Submission Comments, the name of the course assignment links to the assignment . This link allows you to access the assignment submission and view any associated attachments that may be part of the submission comment. In the text window, type your comment for the submission . Click the Send button . View your reply in the conversation thread. Replies are also posted back to the assignment and can be viewed in the Grades page and the assignment submissions page. Previous Topic:How do I privately respond to one individual in a group message as a student? Next Topic:How do I forward a message from a conversation as a student? Table of Contents > Conversations > How do I reply to submission comments in Conversations as a student?